Invest in the future, buy farmland...the ultimate Green Investment! There is nothing better than owning your own piece of land. Demand for farmland remains at current high levels even though the general agricultural economy has worsened over the past year. Land prices have eroded in parts of the mid west U.S, but seem to be holding steady in the more diversified commodity choices in the South, especially rice farms. Uncertainty in the stock market and American business has entrepreneurs and investors looking at more tangible investment vehicles. Finding that perfect piece of land for hunting, investment, commodity production or residential purposes can be a difficult task. Hiring a professional company to guide you will make all the difference to ensure you get what you’ve been looking for. Here at White Land Company, we are in the epicenter of fertile Mississippi River delta land with abundant irrigation water. 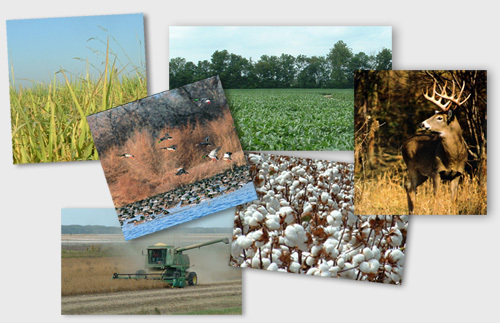 The Arkansas, Mississippi, Louisiana delta is filled with highly productive agricultural land. Agricultural land has proven to be the safest investment with the highest return over the past 60 years. The leveling off of land prices in the south is thought to be only temporary caused by the low commodity price cycle. When commodity prices start to show improvement, and they will, appreciation rates will also return. That being the case, now is a good time to invest in highly improved farms. Our world is becoming more affluent and the masses are requiring more abundance and variety of foods. That, in turn will have an upward push in higher commodity prices, thereby accounting for the continued demand and appreciation of agricultural lands. White Land Company has been in business since 1977 and is known as a reputable farmland real estate company in the Mississippi Delta region. All of our agents have the experience and dedication required to steer you in the right direction for farmland investment. All of our agents were born and raised on southern farms and their entire lives have revolved around the agriculture industry in the Arkansas, Louisiana, Mississippi delta region. In addition to purchasing investment property, we also sell undeveloped and developed hunting and recreation properties. The Mississippi flyway is world renowned for its stature in waterfowl hunting, especially in the rice fields and green timber located in this region. We are a licensed land real estate company in Arkansas, Louisiana and Mississippi and we currently have istings of agricultural and recreational properties. Contact us for answers to your concerns about agricultural and recreational land investment. We believe the experience gained over the years puts us in a unique position for our buyers and sellers as compared to other realtors. Thank you for visiting our website. We welcome you to browse our website for more information on our services. We cater to the people of the United States and our experience in land investment since 1977 puts you in competent, and ethical, hands when you desire to seek out this great investment vehicle. We guarantee that we’ll help you find that perfect piece of land that will yield the return on your investment that you deserve. Please feel free to contact our office to set up a consultation. We look forward to hearing from you.